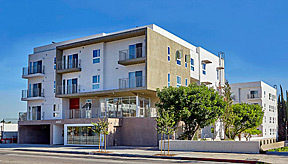 Located in the Glassell Park community of Los Angeles, T. Bailey Manor opened in August 2017 as a mixed use development, including 46 newly constructed apartments and 2 commercial spaces in a renovated existing building. The property serves households with special needs, including formerly homeless veterans, other special needs individuals and families and persons with developmental disabilities. The property serves homeless individuals including veterans and persons with developmental disabilities and other special needs. To support the needs and aspirations of residents, the development features a community room, meeting rooms, a computer room, and a laundry room. 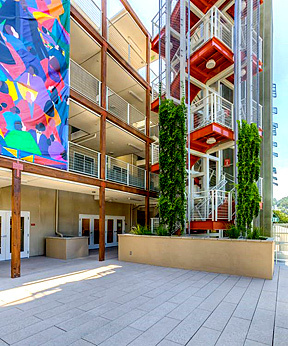 Outdoor areas offer an open courtyard with edible landscaping; along the side and rear yards, colorful vines and landscaped areas screen and shade the building while providing a calming and attractive space. Supportive services for these special needs households are provided by Eastern Los Angeles Regional Center (ELARC), Housing WORKS, and Women Organizing Resources Knowledge and Services (W.O.R.K.S.). Opened in September 2015, Teague Terrace is the second WORKS development targeted to individuals with special needs. 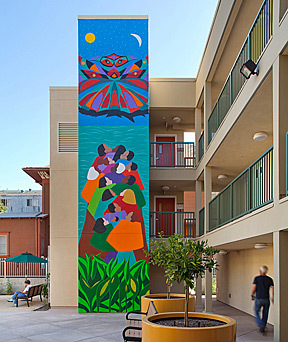 Teague Terraces 56 single and one-bedroom apartments serve persons with development disabilities and formerly homeless individuals with special needs, including formerly homeless veterans. Unit rents are affordable to persons earning 25% to 40% of Area Median Income. The property includes a community room, a lounge, a computer lab, and a landscaped courtyard with community gardens and a barbeque. Located in the Eagle Rock area of Los Angeles, the building is convenient both to community shopping and to public transportation. Housing Works partners with WORKS to provide intensive case management for residents. Opened in 2011, Young Burlington is the first WORKS development with supportive services for a special needs population of transitional aged 18 to 24 year old youth. The 21 newly constructed one bedroom apartments house young people earning no more than 25% of Area Median Income. The property features a community room, a lounge, a computer lab and a courtyard with community gardens and barbeques. The property is located just west of downtown Los Angeles and is convenient to both community shopping and public transportation. Housing Works provides case management for residents.